Valeriy Kholchik serves as the Director of the "Let's Love" Foundation. He and his family lives in Gorlovka (Donetsk region). Valeriy is the minister of Gorlovka Church of Christ. 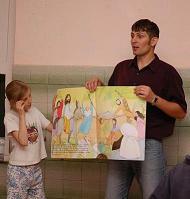 He graduated Ukrainian Bible Institute (the Branch Scgool of the Sunset Internation Bible Institute) in 2005. He married and has three children. Eugene Dovzhenko is the Co-Director of the "Let's Love" Foundation. 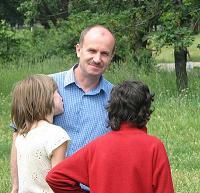 He lives in Donetsk and serves for "Revival" Church of Christ in Donetsk. He graduated Ukrainian Bible Institute (the Branch Scgool of the Sunset Internation Bible Institute) in 2005. He married and has two children.